This is the kind of recipe where I wish I had my own cooking show. For starters, I'd give this recipe a longer and swankier name such as "Succulent Tofu Fish Fillet over a bed of crisp Romain lettuce topped off with fresh papaya salsa and tucked into a warm pita bread." (Are you drooling yet?) I'd also take the time to tell viewers that the heels of bread make for the best bread crumbs. All you have to do is throw them into your food processor and let the motor run until the crumbs are formed. Homemade crumbs are not only cheaper, but they taste better too. They also don't have salt and other preservatives in them. But alas! This is a blog - not a cooking show - so here's the recipe! Kelp is what makes the tofu "fishy". Serve it as a fillet or cut up small pieces for "fish sticks." Fresh papaya chunks can be used in place of the salsa. Preheat oven to 350F. Line a baking sheet with parchment paper and set aside. Cut tofu into 5 slices (or smaller pieces for nuggets) and set aside. Place bread slices in food processor and process until crumbs form. Add spices and Old Bay to taste, a few dashes of black pepper to bread crumbs and process for 1 more minute. Transfer breading mixture to a shallow bowl. From here, you can bread the tofu one of two ways: lightly spray one side of the tofu with your oil spray can and press the breading into one side of the tofu (giving one side a thick, flaky crust) or dip the tofu into soymilk and lightly batter the entire fillet. 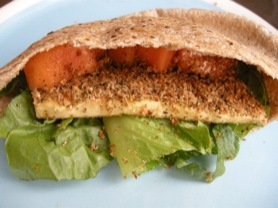 Bake 25-30 minutes and serve tucked into warm pitas with chopped lettuce and papaya salsa.